With more and more data created by – and stored on – endpoint devices, enterprise IT departments must ensure that they understand and account for the increased presence of mission-critical data on those devices. 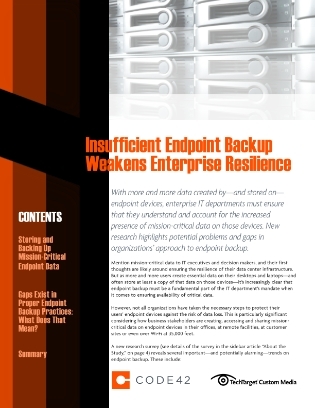 Access this white paper to delve into new research that highlights potential problems and gaps in organizations’ approaches to endpoint backup. Inside, find out why smart IT leaders are looking for automated endpoint backup solutions to make endpoint backup a seamless, efficient, and affordable process.